Liquin is a durable, non-yellowing medium for thinning oil and alkyd colors, and speeding drying time. 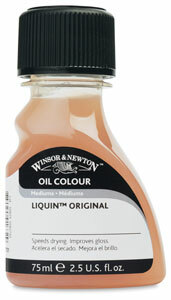 Winsor & Newton has extended its popular line of Liquin with a variety of superb, new products. Liquin Oleopasto — A semi-matte, quick-drying medium, Winsor & Newton Liquin Oleopasto has a soft gel consistency with some brush drag, ideal for leveling crisp brushmarks and providing bulk in impasto and texture work. When added to paint, Liquin Oleopasto extends tube color. When dry, it retains knife and brushstrokes and won't level out. It dries to a crack-resistant, virtually non-yellowing film. Liquin Fine Detail — The most fluid of the Liquin family of products, this gloss medium is ideal for fine detailed work, for producing a smooth surface picture, or in smoothly blended areas where brushmarks are not desired. The modern alternative to traditional copal mediums that were based on natural resins and offered fast-drying properties to artists, Fine Detail approximately halves the drying time of oil color, depending on the proportions added. It is touch-dry in one to five days, depending on the climate, colors used, and film weight. It is not recommended for use as a varnish or final coat. Liquin Impasto — This is a semi-gloss, quick-drying, non-yellowing impasto medium that retains crisp textures and brush strokes without any visible leveling. It also extends tube color, provides bulk, and allows more blending time. When dry, it forms a flexible, tough film that can be varnished in the normal way. Use it for heavier brush work or palette knives. It is not recommended for use as a varnish or final coat. Liquin Light Gel — This Liquin formulation is a slight gel that breaks down on brushing (thixotropic) and flows out to give a non-drip effect when mixed with color. It is ideal for glazing, and dries to a gloss film that has an increased resistance to yellowing. Liquin Light Gel offers all the handling properties traditionally seen with the historic Meglip mediums but without the tendencies to crack and yellow that are normally associated with mastic mediums. It is not recommended for use as a varnish or final coat. Liquin Original — This reliable favorite (formerly known simply as "Liquin") is a general-purpose low gloss medium that improves flow and transparency. It mixes easily with the brush or knife, smoothes brushwork, and is also suitable for textured oil techniques. Liquin Original approximately halves the drying time of oil colors, resulting in a drying time of anywhere from one to five days, depending on climate, colors used, and film weight. It is not recommended as a varnish or final coat. ™ Winsor & Newton is a trademark.™ Liquin is a trademark. Liquin is a very useful medium used to speed the drying time of your oil paint. Learn about the different Liquin Mediums from Winsor & Newton. We'll explain what each one is best used for and how to integrate it into your painting process.